This week would have been the 50th Pasta all’Amatriciana festival in Amatrice, Italy. 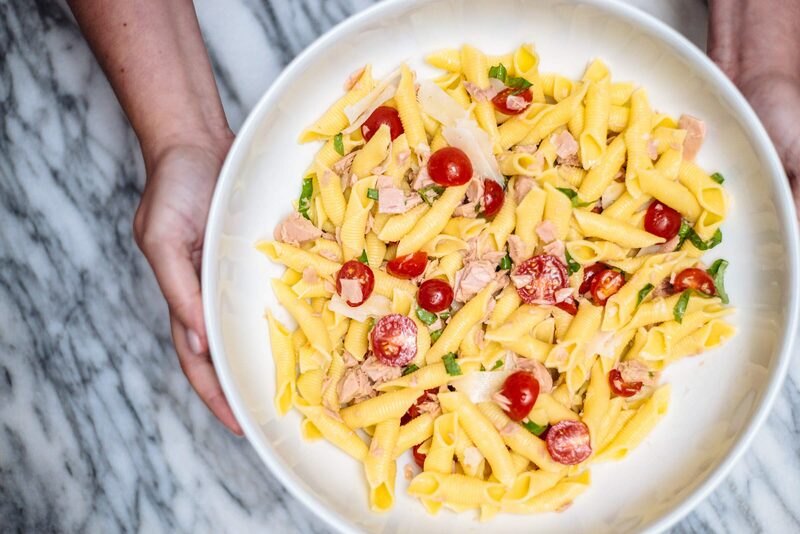 In honor of the victims of the tragic earthquake that struck central Italy last week, we wanted to share our version of this classic dish and the ways that you can help. Restaurants around the world and in San Francisco area are donating funds to the Italian earthquake relief. In San Francisco, La Ciccia, A16, and Montesacro are all donating funds when you order all’Amatriciana dishes. To donate directly to earthquake relief, you can use this link. You can also honor the people of Italy by making pasta all’Amatriciana this week. Pasta all’Amatriciana is super simple and delicious. There’s very little meat in this dish, but you can use guanciale (cured pork jowl), pancetta (cured pork belly), or thick cut bacon. All of these options will add the classic salty pork flavor to your dish. We weren’t able to get our hands on guanciale, so we decided to use pancetta and it was simply delicious! What’s great about this dish isn’t just the amazing flavor, but also how easy it is. You cook the bucatini pasta while you’re making the sauce, and then you marry them at the end. Bucatini is one of our favorite pasta shapes. If you are interested in learning more about pasta shapes and sauce pairings, we’d recommend reading Geometry of Pasta. We didn’t even know about bucatini until we visited Italy. It’s similar to spaghetti, but it’s a tube shaped pasta. The tube allows pasta water to get trapped – which makes your pasta at the end even better! 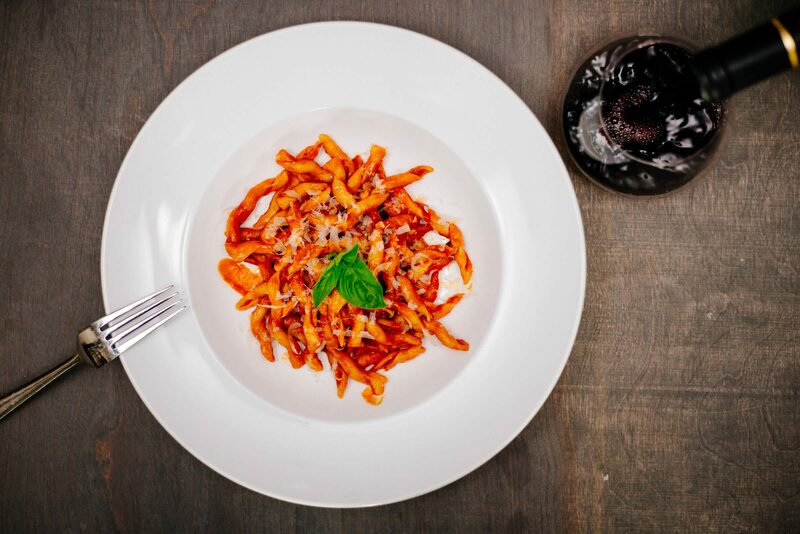 We served our Pasta all’Amatriciana in our favorite large restaurant dishes and paired it with a bottle of Barbera d’Asti wine. Our good friends George and Stacey gave us this beautiful wine coaster when we moved from Chicago. We always miss them at dinner, and love to use it often because not only does it protect our table from dripping wine, but it reminds us of dinners with them. Sitting around the table eating with family and friends is important to us and we hope you find time to do the same with your friends and family. Meanwhile, heat butter in a large sauté pan, then add the guanciale or pancetta and cook until it begins to brown. Add the diced onion and a the crushed chiles, along with a pinch of salt. Cook until the onions are translucent. Add the tomatoes and bring the sauce to a simmer. Salt to taste. While the sauce is simmering, add the bucatini to the boiling water and cook for one minute less than the package directions indicate. When the pasta timer goes off, use tongs to move it into the simmering sauce, along with ¼ cup of the pasta water and the grated cheese. 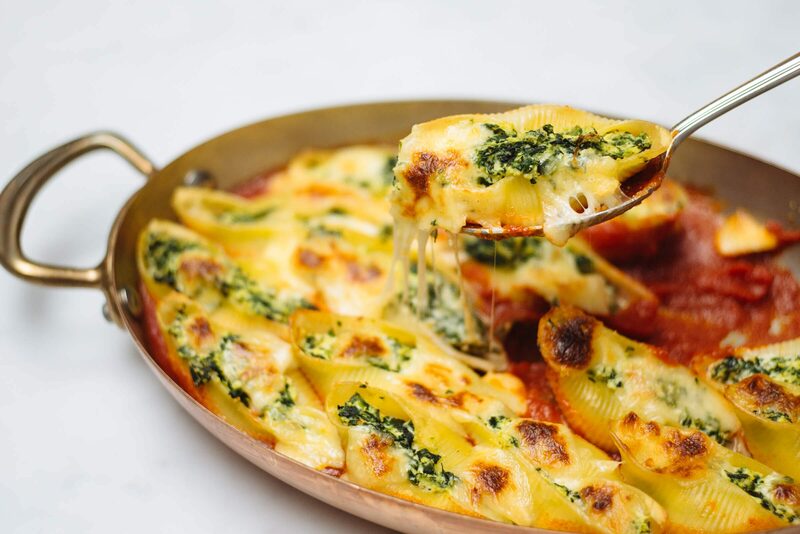 Toss the pasta to coat with the sauce, top with freshly grated cheese, and serve.